Well, it’s finally that time again. While there is seemingly a new Android phone launch every week, Apple updates the iPhone but once a year. That leads to much anticipation. But it also puts the pressure on Cupertino to make sure it packs a year’s worth of innovation into each release. There may or may not be much mystery left, with most pundits convinced we will see a new high-end iPhone alongside a midrange model expected to be dubbed the iPhone 5c. As always, the details will be telling, and it remains to be seen if Apple has a trick or two up its sleeve. Whatever the case, AllThingsD will have the details, with live coverage from Ina Fried, John Paczkowski, Lauren Goode and the rest of our team, starting this morning at 10 am PT. 9:54 am: Okay, we’re here and seated. 9:59 am: Every seat is filled in Apple’s Town Hall auditorium. 10:00 am: And we’re off, promptly at 10 am. Tim Cook enters wearing blue jeans and a charcoa-gray button-down shirt. “Welcome to Cupertino,” Tim Cook says, also welcoming those on livestreams in Tokyo and Beijing. Cook is touting iTunes Festival, a live concert series that the company does. Lady Gaga performed. Others coming up include Katy Perry, Elton John. 20 million people applied for the free tickets to the live event in London. “It’s like the opening weekend for a product,” Cook said. The concerts are also streamed live (and, in some cases, on demand). “And we prepared a video” (another page from the playbook). “It’s a month of incredible music,” Cook promised. Apple had a small, 1,100-square-foot store in the Stanford shopping center that was always packed with customers spilling out onto the courtyard (as contrasted with its neighboring, often-near-empty Microsoft and Sony stores). This past weekend, the small Apple Store was replaced with a giant new one. 10:08 am: On to iOS and iOS 7. But, getting a dig in on Android, Cook notes that Apple users get updates quickly, meaning that iOS 7 will become the world’s most-used mobile operating system. 10:09 am: Now up, senior VP of software engineering Craig Federighi, showing the new look of iOS 7. One new iOS 7 feature gives recommendations of when you need to leave for work to get there on time (a la Google Now). 10:11 am: It’s review time for iOS 7 — new Safari, Siri improvements, better multitasking, etc. 10:13 am: Still reviewing iOS 7. Now on the camera app in iOS 7, which lets one swipe between different camera lenses and groupings of photos taken into various “moments” grouped by location. 10:16 am: Showing some redesigned iOS 7 apps, including Zillow, NBC, etc. Downloading iOS 7 is like getting a whole new device, Federighi says (a frequent Apple refrain for new OS updates). iOS 7 will be free starting Sept. 18. 10:17 am: Tim Cook back onstage. Cook talking iWork now. Cook says iWork is now the best-selling productivity apps on any platform (not sure how that is being measured vis-a-vis Microsoft Office). But clearly there are lots of copies of Numbers, Pages and Keynote on Macs and iOS devices. Ah, best-selling mobile productivity apps (Office is only on Windows Phone, for the most part). iLife apps are pretty nifty too — iMovie, iPhone. Starting today, Apple is making all five free on any new iOS device, Cook announces. 10:21 am: On to the iPhone. A few of you may have been expecting this, Cook said. He’s prepping to discontinue it. In the past, Apple has kept old ones around and lowered prices. This year, we are going to replace the iPhone 5. We’re going to replace it with not one, but two new designs. “This allows us to serve even more customers,” Cook said, giving way to marketing chief Phil Schiller. 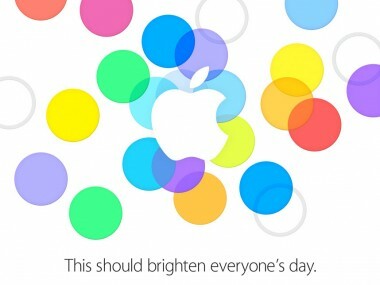 10:23 am: Phil Schiller confirms the new “colorful and fun” iPhone 5c. A few of you may have seen some pictures of it on the Web. Now demoing it. Green, white, blue, red and yellow models are shown. 10:25 am: Apple is making its own colorful silicone cases that let iPhone 5c colors shine through. 10:25 am: The iPhone 5c casing is made of polycarbonate, but is steel-reinforced with that steel serving as an antenna. Four-inch Retina display. Powered by an Apple A6 chip, with a battery that is slightly larger than the iPhone 5’s. Has an eight-megapixel camera, like the iPhone 5. Front-facing HD camera with larger pixels than its predecessor. The iPhone 5c supports more LTE bands than any other phone in the world, Schiller says. It’s blue, white, pink yellow and green. The phones are arsenic-free and Android-free, Schiller promises. iPhone 5c is beautifully, unapologetically plastic. So, the price of the iPhone 5c is basically what Apple used to get for its year-old model. Video still going on. Plastic is wonderful. 10:33 am: Schiller back, now talking about the iPhone 5s, as expected. The iPhone 5s is the most “forward-thinking” phone ever, Schiller says, cueing yet another video showing it in all its golden (and white, and black) glory. “It is the gold standard in phones,” Schiller says. Three big new features, Schiller says. First is performance. It’s powered by A7, the first 64-bit chip for a phone. “I don’t think the other guys are even talking about it yet,” Schiller says. Schiller promises the transition will be easy for developers, and will deliver up to twice the performance and graphics processing of its predecessor. New iPhone is 40 times faster than the very first one, Schiller says. It runs the latest graphics standard, OpenGL, for console-level graphics. And now, demo time, as Epic Games’ Donald Mustard comes to show the new iPhone 5s engine in action. Mustard unveils Infinity Blade 3 — the “epic conclusion” to the Infinity Blade trilogy. Mustard says Epic was able to convert Infinity Blade to 64-bit in just two hours’ time. Anyhoo, Infinity Blade III will hit as the new iPhone is available. 10:44 am: Schiller says the iPhone 5s also adds the M7 “motion co-processor” to continually measure sensor data from accelerometer, gyroscope and compass. That paves the way for new health-and-fitness apps, Schiller says. New chip can tell if stationary, walking, running or driving. Schiller says Nike is creating Nike+ Move app using the chip and GPS to track activities. Gives you Nike Fuel points and lets you compete with friends. Battery life is equal to or better than iPhone 5, Schiller says, with up to 10 hours of 3G talk time. 10:47 am: Camera is improved, too. A new five-element, Apple-designed camera with 15 percent larger sensor and an f2.2 aperture. Apple uses that area for bigger, 1.5-micron pixels, rather than pack more pixels. Camera is taking multiple photos and choosing the sharpest one automatically, Schiller says. The iPhone has two LED flashes to better match the color of lighting in the room. A new burst mode takes 10 frames per second for capturing action shots or stills of a squirmy kid. Camera roll presents what it thinks might be the best (though you can choose from among all taken). There’s also a slow-mo camera that takes 120 frames per second so you can slow down fast-moving action. Schiller showing a bunch of unedited, un-retouched iPhone 5s photos, including some flowers, some peppers, a jellyfish, etc. Okay. That’s the new iSight camera. I think we’re about to meet the fingerprint sensor. “The third feature is all about security,” Schiller says. Gone are the days of paper you could protect by locking. Best current way is passcode, but about half of users don’t even use that. 10:57 am: Yep, “Touch ID,” which uses fingerprint. iPhone 5s uses “Touch ID” sensor that is smaller than a human hair, but can scan a fingerprint at 500 pixels per inch. And — also as expected — the sensor is in the home button (which can still perform its original function). Touch ID is built deeply into iOS 7, and can be used to unlock the phone and make iTunes purchases. And, since we haven’t had a video in a few minutes, Apple is showing one with Jony Ive talking about the fingerprint sensor. “It actually enhances the user experience,” Sir Jony promises. For those who forgot, the fingerprint tech is the result of Apple’s purchase of AuthenTec last year. 11:02 am: Other apps don’t get access to the fingerprint, nor is it stored on Apple’s servers. 11:03 am: So the iPhone 5s features are pretty much as expected — fingerprint reader, along with improved camera and faster processor. Prices are the same, too: $199 for 16GB, $299 for 32GB, and $399 for 64GB, with Apple-made leather cases for $39, including a (Product) Red one. The iPhone 4S will also stick around and be free at many carriers after rebate. iPhone 5c preorders start Sept. 13. iPhone 5c and 5s will go on sale a week later in U.S., Australia, Canada, China, France, Germany, Japan, Singapore and U.K.
11:06 am: Okay, back to Tim Cook. It’s recap time and, of course, a preview of a commercial. “We hope that you love these new products as much as we’ve loved creating them.” Cook says, thanking the employees who worked on it. As Apple has in the past (though not for a while), Apple is bringing on a musician. “How are you all doing?” Costello says, saying he feels underdressed with all the fancy stuff Apple showed off. 11:20 am: Costello says he has a new album coming out next week. 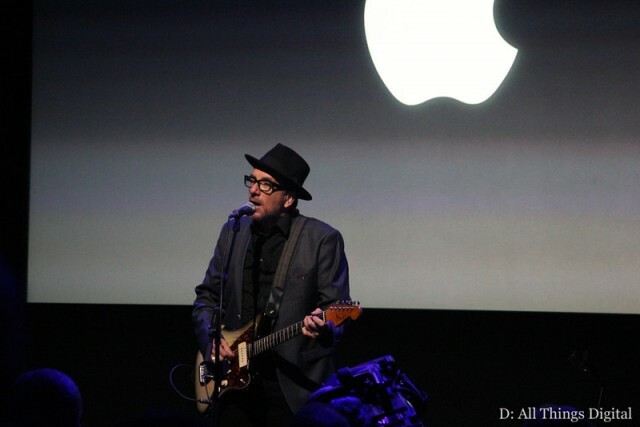 “See, I’ve got product announcements, too,” Costello quipped, ending with a sad song off that album. Apple’s press releases just hit, too. Here are iPhone 5s details and iPhone 5c. Okay, concert and event are wrapping up. Some hands-on time for reporters. Thanks for tuning in.